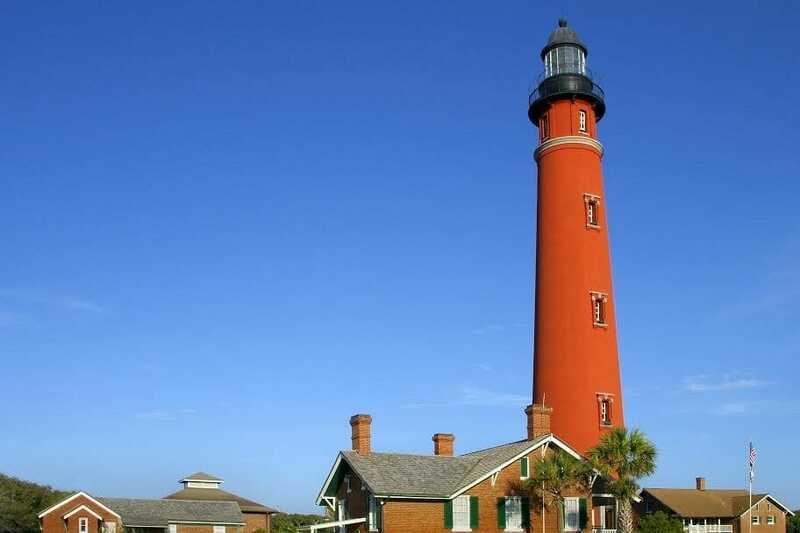 Ponce Inlet Lighthouse - The Ponce De Leon Inlet Lighthouse is known to be the tallest lighthouse in Florida and the second tallest in the nation, a great first stop on your fun two-day Daytona Beach trip. This lighthouse is an integral part of the Ponce Inlet, the "nation’s best beach," home to the best East Coast surfing and tons of historical, cultural, and entertainment opportunities. The lighthouse itself will allow your group to step back in time and learn all about the rich cultural background of this area, as well as take in the best views all around! Standing at an astounding 175 feet tall and boasting 203 steps, this lighthouse is also known as the best preserved and most authentic historic light station in the nation, with 170,000 guests annually climbing the steps to this National Historic Landmark. Be sure to bring your camera to capture these amazing views, and also plan enough time to take a historically and culturally informative group tour before you go! Marine Science Center- Next stop, the Marine Science Center, a fun and immersive "environmental odyssey" located on the Inlet that will allow you and your group to get up-close and personal with some of the native marine animals and learn all about their habitats. This sea turtle rehabilitation center is home to seven full turtle hospital pools (Turtle Terrace) and has seen more than 17,000 rehabilitated turtles swim in and out of their facility, as well as an impressive 4,500 seabirds. While here you will have the chance to visit a living reef aquarium with 300 year old coral, a mangrove estuary, and several interactive exhibits such as the stingray touch pool, housing Atlantic stingrays in a 14,000 gallon tank! Be sure to save plenty of time to stop by the gift shop on your way out and play your part in contributing or donating to the cause! The Casements - Welcome to The Casements, the historic winter residence of American oil magnate John D. Rockefeller, known as the Jewel of Ormond Beach. Here, just two blocks away from the Atlantic Ocean on the shore of the Halifax River, your group will find the incredible mansion in Ormond Beach, first established in 1910. The Casements is today owned by the city and used as a cultural center, social gathering spot, and public park space. This land is used to learn about the history of Ormond Beach, the culture of Rockefeller's time, and even hold special events such as weddings and free movie days. Enjoy the absolutely amazing Queen Anne style architecture, or sometimes also referred to as shingle style architecture, as you see up-close and personal exactly why this property was named after its large hand-cut casement windows that beautifully adorn the mansion! Daytona 200 Monument - The Daytona 200 Monument is the amazing local tribute to the original Daytona Beach races and the origins of Bike Week, an exciting and culturally important Daytona icon that any racing fans or motorcycle junkies in your group is going to love. This monument works to honor the men who raced the beach in the past, the very first Daytona 200 in January 1937 involving a 4.2 mile beach and road combination course. That first race was the start of the soon-to-be-famous Daytona Bike Week, today the Daytona 200 Motorcycle Race drawing in a half million bikers and non bikers alike! There are several annual events, such as the annual Monument Party that take place here, as well as regular dedications to the Wall of Champions. This five foot wide by four foot, eight inch thick granite wall is covered in 28 names of those who have played a part in the historic Daytona movement! Howard Thurman Home - Welcome to the historic home of Dr. Howard Thurman, the three-bedroom home that sits on the corner of Whitehall Street in Daytona and has a largely important cultural and historic place in the surrounding community. Added to the National Register of Historic Places in 1990, this childhood home of Dr. Thurman holds various daily tours, meetings, events, seminars, and workshops here and serves as a great place for the public to learn the intellectual roots of civil rights. This locally important culture and education center tells the story of the man who created, taught, and wrote about different action-oriented non-violent ways to promote civil rights, right alongside Dr. King and the Civil Rights Movement. Dr. Thurman was named one of 50 of our country's most important men in African American History in Ebony Magazine and it is quite easy to see exactly why after your visit here. The tours are available by appointment only for large groups but are completely worth it to pay tribute to a "lifetime of successes and firsts." Jackie Robinson Ballpark + Museum - End your Daytona Beach dream visit with a trip to the iconic Jackie Robinson Ballpark and Museum, the site of the first racially-integrated MLB game in all of baseball history! Here you and your group can grab historic photographs with the memorial statue of baseball pioneer Jack Roosevelt "Jackie" Robinson, who was the first man to crash the barriers banning black athletes from the sport by becoming the first African-American to play modern-era major league baseball. The ballpark, today home to the Daytona Cubs and Bethune-Cookman Wildcats, was renamed in honor of Jackie in 1989, making a truly classic stop and Daytona Beach favorite for visitors and locals alike! This is the best local venue for classic minor league action, an old-school sporting vibe, and iconic history legends ready to be explored, so be sure to save plenty of time to enjoy it all (and be sure to bring your camera! ).